When did these sprout on our streets? 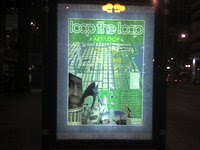 well, like they are faux design, their faux raison d’etre on one side is what purports to be “City Information.” This one has some vague message about art in the loop. I’d probably rather see a streaming blog from the Mayor. If we’re going to put more stuff on our streets, make them the modern design that Chicagoans are so good at, not a faux imported older style. “came from Otto Wagner, the Austrian architect of Vienna’s art nouveau metro, and Joze Plecnik, a Slovenian who worked in Vienna and Prague. Hop on the bus, Robert. PS – Talk about homogenization, the French company that provides these panels and the bus stops puts their products in about fifteen thousand cities around the world! 15,000! And they’ve been investigated in more than one of those cities of bribery and corruption of public officials. You are currently browsing the archives for the Otto Wagner category.